Ahead of its arrival here next year, we’re reporting LIVE from the official unveiling of the next-generation MINI at Cowley today, bringing you all the key information about the new car along with pictures and our first impressions. We’ll also be on hand to answer any questions you have – so drop them in on here and we’ll pose them to the PRs and Engineers and have an exclusive interview with MINI Designer Anders Warming. This is fantastic news. 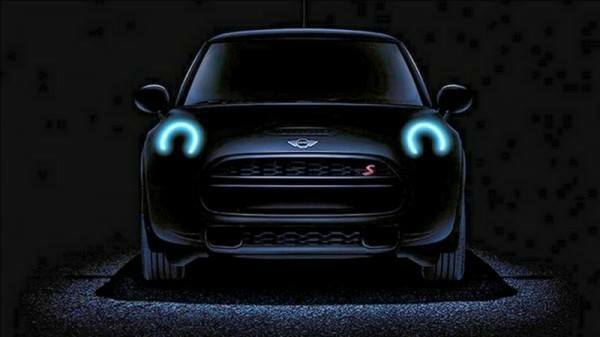 The F56 promises to be the best Mini ever, with new platforms and powertrains. I only wish I was available to participate – further evidence of the quality and growth of this website. Looking forward to the official launch! A Modern MINI magazine reader sent in this ‘spy shot’ he took of a heavily camouflaged F56 MINI Cooper in a car park in Oxford. Interestingly all of the interior was covered over with blanking covers. 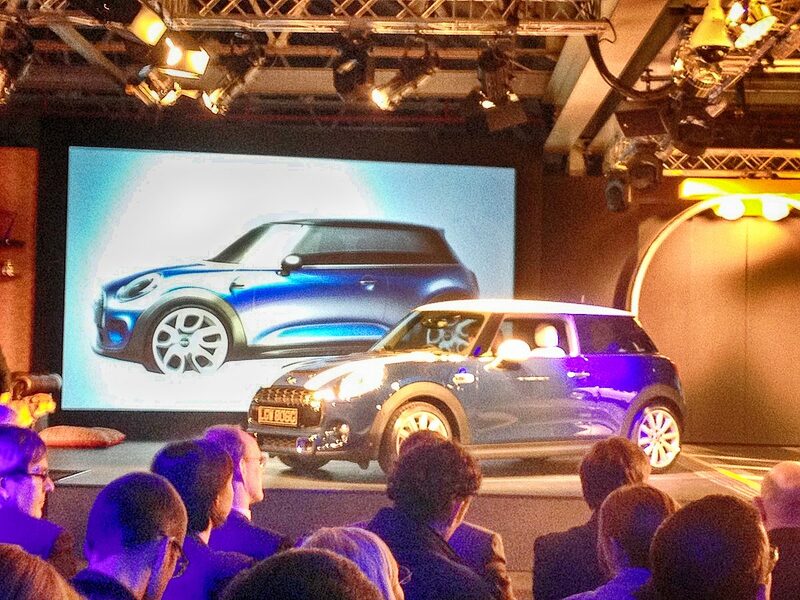 I think everyone is waiting with baited breath at the arrival of this new mini and the direction it will take. I hope the standard mini shape is retained. My neighbor has an early 51 plate red cooper and it still looks really nice! I have never been convinced by the Countyman versions which look too big a bloated to carry the Mini insignia. Remind me of the styling blunders of the ADO71 Austin 1800 range. I still think an uodated ADO16 Riley hatch would be very marketable using the same platform or a Triumph Dolomite version on the same platform. Is there still a Riley Elf version planned for China where booted cars carry more prestige? Time for the dormant British brans to make a come back. MINI is well underway testing the third-generation of its Convertible, as evidenced by these photos, showing the new droptop riding along on a flatbed. Codenamed the F57 – as opposed to the “F56” designation for the Hardtop – the Convertible will ride on the same UKL front-drive architecture that will underpin its hardtop brother. From the beltline down, we can expect the Convertible to feature almost identical styling to the Hardtop. Based on the spy photos, there’s not a lot to see above the belt line, either. The roof carries roughly the same shape, and will probably fold in a similar Z-pattern to the current canvas top. Underbonnet, the Convertible should share its powertrains with the Hatchback, meaning the top-flight mill will be a 2.0-litre, turbocharged four-cylinder with 189 horsepower and 207 pound-feet of torque. A turbocharged, 1.5-litre three-pot will be the standard engine, but should still come to play with 134 horsepower and 162 pound-feet of torque. While the F56 Mini will debut in a few weeks time, we’ll be waiting much longer to see the F57 Convertible, with our spy claiming an on-sale date in 2015. Does anyone know the Chinese content of this car? No. So how about you tell us, and is this yet more hear say or is it fact? @8, Read the post again its called a Q U E S T I O N.
Okay then francis. you put it in a way that smacks of you know the answer and it’s not good. Why do you think there is any more or less Chinese content than the current Mini (or any other car)and why is it important? @11, It was hardly a loaded question was it? Anyway perhaps i sought to add some mischief early on in the thread, i dont know if it has Chinese components or not, but if it was the MG6 or 3 somewhere along the way would be a comment about its content being sourced from one country or another. Everyone wants to blow each other off over the new MINI but wont give the time of day to the very decent £8k MG.
Because its Chinese. Like an iphone. UK car buyers wont give the time of day to the £8k MG because it still has hardly any dealer network to support it and is likely to depreciate like it’s been dropped off a cliff…. @13, Last tome i looked this country was socially mobile, so how that stops people from buying the MG holds little water,if someone is happy to travel from Sterling to Rochdale to pick up his new MINI whats to stop the next man traveling for the MG? folk travel the width and length of the country to visit car supermarkets. Maybe just maybe, some folk dont want a MINI,they want a roomy practical five door car. Free TLC servicing vouchers- they was not free, you paid for them somewhere in the deal,and apart from sticking thirty quids worth of oil and filter and a glance over, those packages are all about upsell-“hi sir your rear trailing arm bushes are slightly peeling and perished and require replacement” Translation- nowt wrong with them they will last another five years, ever seen the traffic light sheets dealers use? Try taking one of your alloys off, bet its stuck on, some TLC. Many may travel to buy but not for general service and repairs. There will be a 5-door F57 MINI hatch coming soon, its already coming down the lines at Oxford alongside the 3-door F56. I bought secondhand MINI so the first owner paid £150ish for the TLC but transfers to second owners. Thin smear of grease stops the alloys sticking to hubs on any car…..mines been done so no problems. @15, Nice to see you have a conscientious dealer. You can have any car serviced anywhere anytime under block exemption rules. As you may have gathered im none too keen on those lofty claims of service from dealers,only last week a 58 plate Passat had been to VW for a “health check” 3 road springs broken and a CV boot Clip missing. £194 to replace clip (merely get car on ramp, fit clip) and a grand to do the springs- a couple of hours work. I did it tip to toe all springs and clip £300 all in. I agree about main dealer upselling….once the previous owners TLC ran out I have reverted to DIY servicing or a local independent garage. The worst part about the MINI TLC package was the clogged air filter was left in for 4 years but the cabin pollen filter was changed at every annual service?! @17 And the air filter is cheaper than the cabin filter! If they ignore the air filter, what else do they overlook? The “original” BMW MINI was a wonderful thing to drive. Sorry to say that I’ve not seen anything built at Cowley since 2007 that’s been of any interest to me. I’ll check the F56 out when it arrives, though the styling isn’t promising so far. Only on this web site in response to an invitation to see the launch of a new car live could people start posting over the likelihood of its Alloy Wheels sticking to its hubs! 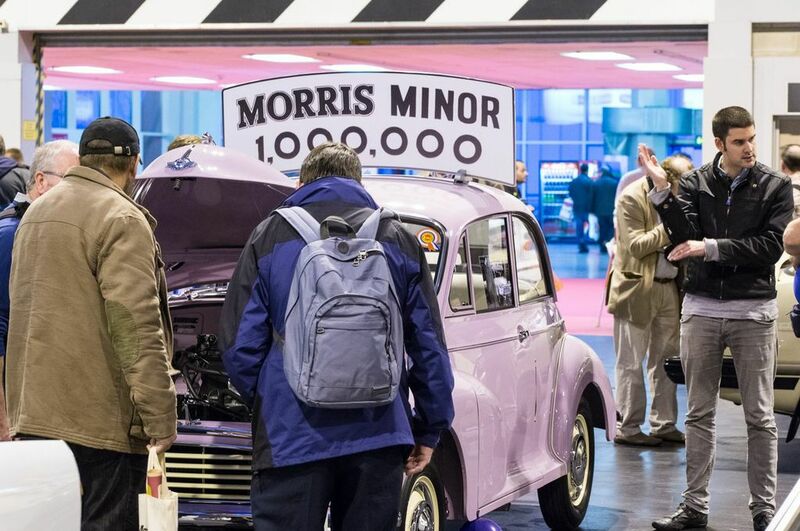 “On 18 November, the all-new MINI will be unveiled to the world in London on the day that classic Mini designer Sir Alec Issigonis would have turned 107. @20, If you read properly you would have noticed a discussion on TLC packages and therefore second hand cars. Thing is if you look at the official service checklist, for say, the humble L-Series, you’ll notice that the pollen filter is down for an annual change, whereas the air filter is every other year. @28, Some VW products specify 50k filter air filter replacements, but you would not leave that unchecked.